This is basically what Fate/staynight could have been. The format is kind of similar to a trailer. First of all, the animation is absolutely fantastic, and the soundtrack isn't bad either. In this version of the Holy Grail War, the main character is instead a girl called Ayaka, whose family was involved in the previous war. She doesn't want to get involved in the present war (apparently they take place every 8 years now). However, she gets attacked by Lancer, and ends up summoning Saber. Who is male. The rest of the OVA is composed of really quick flashes of scenes and battles. It's confusing to watch, and I had to go search online for more info about the characters and such in order to fully understand the OVA. There are many battle scenes in the OVA, and they all seem to be really epic. Special mention goes to Gilgamesh's new powers. 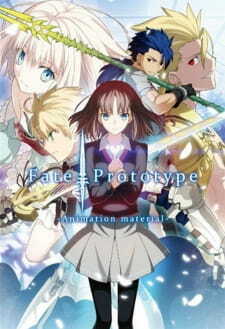 The characters are similar to Fate/staynight, given that this was the prototype for Staynight. The Servants have been slightly redesigned, including making Saber male. The protagonist Ayaka seems to be the generic scared & shy girl type, but then again the OVA didn't really give much time to develop anything. During the quick flashes, we get a glimpse at the villlains, all of which seem to be very interesting. The character who stood out to me blonde girl at the very end who seems to be yandere for male!Saber. Later online searches tell me she is named Manaka, and she's actually Ayaka's sister and a main villan. She feels kind of like Illya to me. Overall, I think this was a really cool concept. I really wish the OVA was longer, as a few searches online gave me some really interesting information that I didn't catch during the quick flashes. Fate/Prototype is not a full-fledged series, or even a proper OVA - instead this is more of a trailer/preview, that was released as a bonus segment with the third season of Carnival Phantasm. This trailer shows Kinoko Nasu's original version of the Holy Grail War, which Nasu later re-worked into what we all know as Fate/Stay Night. Shirou from the original is now a girl named Ayaka Sajyou, and servant Saber is a man (same hero though). There are many commonalities rules-wise towards how the Holy Grail War works, with the main differences being that in this version, the War takes place every 8 years; also, there is a whole new tiered system of masters, which follows the angelic hierarchy (there is more to it, but it was not really possible to fully explain it in a 12 minute trailer). The art in this trailer is actually fairly good, and the short flashes of fight scenes, mostly between Saber and Archer, look great. The character designs are obviously nice and unique, exactly what you would expect from Nasu. There are a lot of similarities character-wise between Fate/Prototype and Fate/Stay Night, and a fan can instantly see how different characters here (like the crazy priest) were re-imagined in F/SN (Kotomine Kirei).The only criticism I can give is that the MC looks quite generic - nothing more than a typical, shy, insecure school-girl, at least judging from this short preview. There really is not too much to say about this one, since it is so short. 12 minutes long preview of a project of such proportions do not do it justice. It is confusing, jumps from one thing to another every 10 seconds, but I suppose that is exactly what you would expect from a trailer. Overall, I can sat that the Fate/Prototype trailer is quite enjoyable and it led me to take quite an interest in the Fate/Prototype universe. There is a lot more to read about it online and a whole prequel-LN series named "Fate/Prototype: Fragments of Sky Silver". So if you have some time, give this short preview a try, especially if you are a big fan of Nasuverse. One warning though - if you have never seen or read anything to do with Fate, you will most likely not understand or appreciate this. What if the two Sabers meet for the first time?